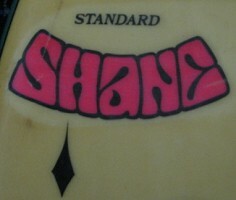 1970 Shane Standard Twin Fin 5 ft 8"
Stringerless blank, Volan glassed with three-quarter deck patch, marbled resin bottom. The fins are toed in, slightly tipped out and have minimum rovings. Bottom: 'Standard' black script, and blue/pink 'Shane' kidney logo at nose. Deck: clear with with black resin watch hand and green rail overlap. Board support by Garry Crockett, with thanks. 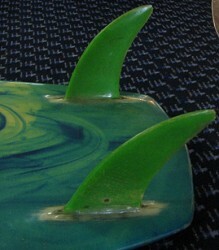 Note : Very rare twin fin example.